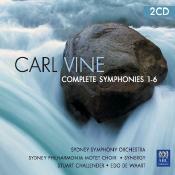 Carl Vine’s six symphonies trace concisely the evolution that brought him back to the original symphonic tradition that modernity temporarily curtailed. Carl Vine’s metaphor for his own symphonic practice is drawn from the natural sciences: composition begins with a ‘crystal’, a musical idea whose characteristic angles and planes are explored and transformed in the course of the work’s creation. This process of transformation, of presenting material in varying lights, coupled with the composer’s sense of timing, makes for a series of works whose inherent drama is considerable. These recordings feature the Sydney Symphony Orchestra under the batons of Edo de Waart and the late Stuart Challender, with the assistance of Synergy percussion ensemble ("Percussion Symphony") and the Sydney Philharmonia Choir ("Choral Symphony").